There are a few important things that can go wrong in print and taking risks seemed a bit silly. The first problem is that colours are always a bit off compared to what you see on your screen. For example the dark-grey cover background and the black details are not distinguished, unless you shine a light on it and stare hard. And the cloud highlights aren’t as bright as they look on your screen. Compare the picture above with the cover image up right. Second, even for black and white, white and black are relative terms: what looks white on my screen turned up… well, look at the picture below. The edge has been photoshopped off because it looked dirty but I didn’t realized how dirty it would have turned out in print. The same can be said for printing colour images in black and white. In case you wonder Hexographer rivers and hills are extremely hard to tell apart in black and white. The last concern is that interacting with a PDF and a physical book is very different. You can’t hold a PDF, use different fingers as bookmarks, it looks less in need of whitespace and, well, digital books can be searched more easily. It’s also easier to annotate physical books and, for some reason, the kerning in the printed cover looks much worse. AFG is going through its last production phases. The transcription and playtest of the adventure “The Volcano and the Temple Beneath” is almost done. Several awesome things happened during playtest sessions. The book is now longer than my research thesis on both counts of words and pages. It will probably grow enough to justify perfect binding instead of staple. People are reading the last draft and giving feedback. They like what they read. This is good. I stopped tweaking the price lists because enough research on medieval economics and prices and baking is enough. The price list is now DONE, the Game Police will not wake me up and arrest me tonight because of inadequate price lists. Go maniacally through the printed proof and see if there’s something even slightly off. Ask another GM to playtest the adventure for me. Make sure that the distributor and my FLGS will actually carry it. By the way if you want the Digital release of AFG, inclusive of the current PDF, the final PDF and LaTeX source code for the book with all the future updates for free, email me at tsojcanth+afg AT gmail using the email linked to your Paypal account; you’ll son receive a 4.50£ Paypal invoice. The digital version also gives you a 4.50£ discount for the Print+Digital bundle (which is expected to cost you 12£+s/h), making it free if you plan to get the hardcopy version anyway. The AFG manual is going to come with a mini-sandbox, because there are few things that set the tone for a game better than the adventure at the back of the handbook. What if Fantasy Switzerland had volcanos and a Temple of Cthulhu, containing a huge gold idol? And what if one of the characters knew about the temple contents and “forgot” to tell everyone else to avoid scaring them? Playtest is going well. I expect players to put their hands on the idol Tuesday night. While mapping the zone at a 1 hex = 1km scale (there are reasons for this) I started to feel that simply putting a “mountain hex” was not enough: mountains are not simply “harder” to walk on. Some parts, like ridges, can be extremely problematic, steep and dangerous. So, I thought, ridges can increase the cost of movement and possibly deal some damage to unskilled and/or unlucky mountaineers. Especially if they happen to be simply walking across a mountain range, in the map below the ridges are black and the gap is a mountain pass. So the usual movement cost of 1 per easy terrain, 2 for hills or forests, 3 for mountains is supplemented by the new obstacle category: an obstacle costs 1d6 additional movement points to cross and represents hard-to pass terrain like steep ridges, wide crevices and rivers. Some obstacles might require appropriate an check, like mountaineering, to pass unscathed or in the worst case even to pass them; if the check is failed the character takes damage ranging from 1 hit up to to 2d6 depending on the obstacle, equipment and other conditions. Today it’s editing time here at the Lost Flat of yours truly, mostly spent fixing small bits and bobs and the horrible horribleness that was the Fighting Capability section, then adding items to the shopping list, writing up the Innumerable Demon Gods for the Divinity chapter and cleaning up the section concerning spell research, grimoires and transcription. Then I decided that, damn, if I didn’t include a section on stating that introducing the printing press in a fantasy setting will upset mages and guild members everywhere I’d feel the worst possible typography nerd ever. 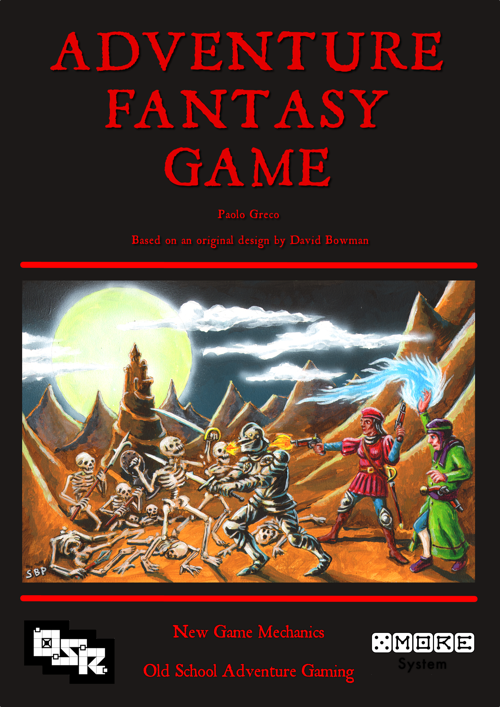 So I wrote it and to be honest it’s shocking to realize that the RPG industry can’t cope with the idea of printing spellbooks in game and that in forty years nobody tried to push the boundary with something as simple as this. Then I realized that the RPG industry is dying like it’s going out of season. So it’s here for you to read and bravely go forward destroying the social equilibrium of your fantasy campaign world. Oh, yes, the preview also has spell research rules usable with any Old School RPG; just remember that a spell level in AFG corresponds to roughly twice the level of the same spell in Old School games. I’ve been using it for the past 15 years in three-four different RPGs with minimal changes and it works fine. Oh, did I mention that AFG comes with more than 80 new, non-SRD spells? And I had to include the Flammarion engraving with the spell research rules because I know it’s a cliche but this is my only occasion to use it, ever. And it’s lovely and loaded with symbolism. Spell research preview: download, print, enjoy. Look, another 3d isometric one page dungeon. Ok it’s half done. I was at the pub and had some isometric graph paper…not the best I’ve done, but a good attempt. Key later on. are very, very interesting. If you people though need something a bit more generic you can download isomorphic graph paper simply by googling it. A solid one comes from Incompetech and is free. Does this channel “Old School” enough? I think it does. Any suggestion?